What makes the Ikea Bekant different? As one of Ikea’s motorized adjustable standing desks, the Bekant is reliable and modern. It is a worthy upgrade to the popular Galant series. It may as well be all that’s needed from an up to date design. Ikea Bekant review – do you really need more? The Bekant is Ikea’s most affordable electronically-adjustable standing desk. This doesn’t mean it is not up to standard as it works very well and it comes with no wobble. At the same time, there are a few other areas where the standing desk is really attractive. Its price is what can draw certain crowds towards the standing desk. It is among the most affordable adjustable standing desks on the market. Ikea knows this and it also situates the product in a range where it can be a good first purchase or even an upgrade. For example, those who have previously used the Skarsta can consider an upgrade to the Bekant. The upgrade comes with the obvious benefit of the electronically-adjusted height. Available in white, blue, black and stained oak, the desk can work in most environments. Unlike the Idasen, the standing desk is actually suitable for home use as well. From this perspective, it is clearly among the solutions which work the best when it comes to versatility. There are simply plenty of options to consider when it comes to versatility, but maybe not as affordable. If there is one area where Ikea stands out that is the ease of installation. The Bekant comes nicely packaged with all the screws and tools needed for the installation process. Its instructions are also dominated by pictures which make the installation process even easier. It can take up to 90 minutes to install the Bekant. 12 screws are attached to the legs with 4 additional screws being used to attach the feet. The desktop is installed as a final step. The entire process doesn’t require special tools. Handing weights of up to 154lbs, the Bekant represents an interesting option for many users. It can be a simple option from Ikea. It is able to work at speeds of 1.25” per second. However, the adjustability speed is less of an issue in the modern world. One of the main issues to address with standing desks comes with durability. For this reason, the Bekant is slightly above its competitors as it manages to deliver impressive results. Of course, these results are not just in theory. They are backed by an impressive 10-year Ikea product warranty. It is also important to know that the Ikea Bekant is not the perfect standing desk. It has its own drawbacks and users need to take them into consideration. For example, the thick rounded legs seem to bother some users. The design is not too bad, but it slowly begins to fade away as more modern alternatives arise. Then there is there is the issue of desktop replacement. If the desktop is going to remain in position for years to come, it is likely to work well. But if users prefer to change the desktop from time to time, the cheap fasteners might need to be taken into consideration. They are not the best and after a few uses, they might give in completely. Another issue which was pointed out in a few cases comes with the official weight limit. If the standing desk can handle considerable weights of up to 154lbs, it can hinder its performance. The higher the weight, the more issues of slower height adjustability the motors deliver. But if this is understandable to a certain degree, it is still recommended to avoid loading such weights on the desk. For durability purpose, it should not deal with its maximum weight capacity. Of course, the standing desk can also come with improved stability. 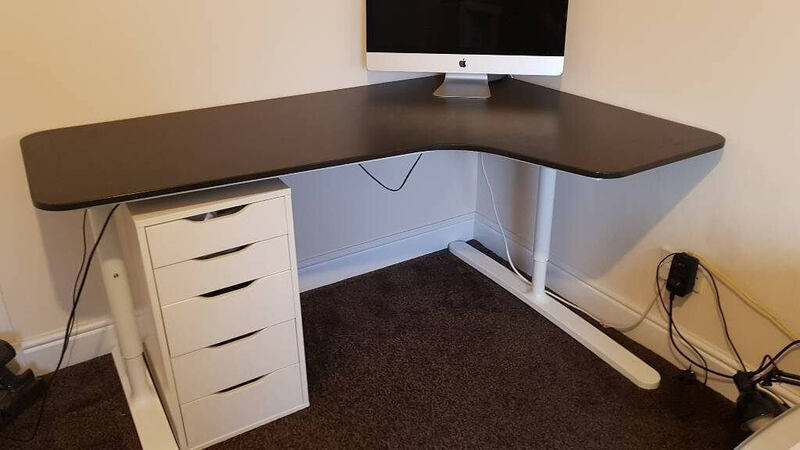 While this is an issue for most standing desks, it has been noted that the Bekant can come with some stability issues which do not necessarily go away with higher loads. The Ikea Bekant is one of the most interesting products in its class. It is very easy to use and it comes with an installation process which requires no previous experience. Furthermore, the standing desk performs at a high level when it comes to the ultimate freedom of movement as it is tested back and forth for durability. 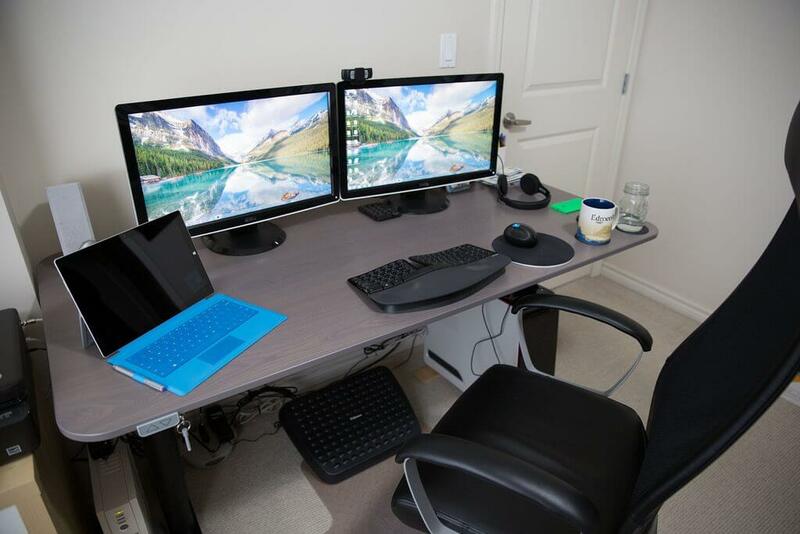 For some users, it represents the perfect upgrade from a manually-adjusted standing desk. For others, the standing desk is just the first step towards a combination of sitting and standing while at the office. Of course, the affordability of the standing desk also comes with its own price. As a few users have noted, the wobble is present at all heights, which is not necessarily the case with its alternatives. However, considering the materials and its lower price point, the Bekant is the mid-range solution from Ikea which can be trusted for years to come, as long as the load is not close to the 154lbs mark.